Expanded Polystyrene (commonly called Styrofoam, through the latter is a distinct product) is a very common and useful substance: it insulates nicely, absorbs shock well, can be formed into almost any shape, and remains sturdy and durable. 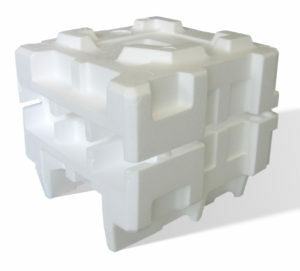 Expanded polystyrene (EPS) is also cheap to manufacture and will not biodegrade. These traits make EPS an excellent substance for insulating coffee cups, supporting car bumpers, and forming biological shipping containers or lightweight coolers for food service. The same traits that make EPS so appealing to consumers, however, also create issues for post-consumer disposal. EPS products often are thrown in the trash because they cannot be included among readily recyclable, conventional plastics. Through there are many reasons why expanded polystyrene is not recycled, the primary cause is often very simple: an EPS reuse or recycling program does not exist nearby. This was the case UW-Madison. A small team of undergraduate students found that the University received over 10,000 EPS shipping containers every month. Every container was sent to the landfill, destined to remain underground for hundreds of years without decomposing. In August of 2013, the team—which labeled themselves “UW-Styrocycle”—presented at the EPA People, Prosperity, and the Planet (P3) competition in Washington D.C. They won Phase I funding to investigate and develop an EPS reuse and recycling program on campus. As a result of these funds, the Styrocycle team was able to collect data about EPS use on campus through life cycle analyses, surveys, and interviews. The results of these studies almost immediately pointed to a massive need for an EPS reuse and recycling program. Within the year, the original team had partnered with another campus organization, WE CONSERVE, to establish a pilot EPS collection program for five buildings on campus. Using the data collected from this pilot program, the team went back to Washington and won a full Phase II grant, allowing Styrocycle to expand. Rebranded as “Boxable: A Sustainable Shipping Coalition,” the team was adopted into the Office of Sustainability and developed partnerships with two other universities to implement EPS recycling programs. The collection program at UW–Madison rapidly expanded to 25 buildings, while autonomous EPS collection programs were initiated at both Washington University in St. Louis and University of Illinois at Urbana-Champaign. Ultimately, Boxable and the City of Madison partnered with Uniek, a local EPS recycling company that makes picture frames, to process all the received EPS. The reuse and recycling program is now running effectively and has become institutionalized on our campus as part of the general practices of facilities and laboratory staff. NOTE: Recycled materials should be clean and stripped of tape, and shipping boxes should be empty.